If you've spent enough time around single Japanese people, you've probably heard the term gokon (合コン). These mysterious gokon quickly take on the image of a sort of regulated speed dating ritual that all Japanese people know. However, looking beneath the surface, it's actually much, much simpler. The term gokon is a contraction of godo konpa (合同コンパ), where godo means "joint" or "combined," and konpa itself is a contraction of either the German "Kompanie" or the English "company" (same meaning). Konpa came into use during the Meiji Period (1868-1912), when it described a meal where university students would get together to strengthen mutual bonds and share the cost of food between them. It's believed the variant term gokon was coined in the 1970s. Despite all the mystery, gokon are actually little more than group blind (or semi-blind) dates. There isn't any kind of gokon association or Facebook page you sign up for, or even a fee for participating; it’s just a group date that a friend or mutual acquaintance might happen to put together. It may be something as simple as three guy friends deciding to meet up with three girl friends for a drink. If you've got a bigger group, somebody will like be asked to act as the organizer (幹事・kanji) for the event—but just on a casual basis. The kanji will get the ball rolling by separating the men and women into groups of equal size (3:3 and 4:4 are common). 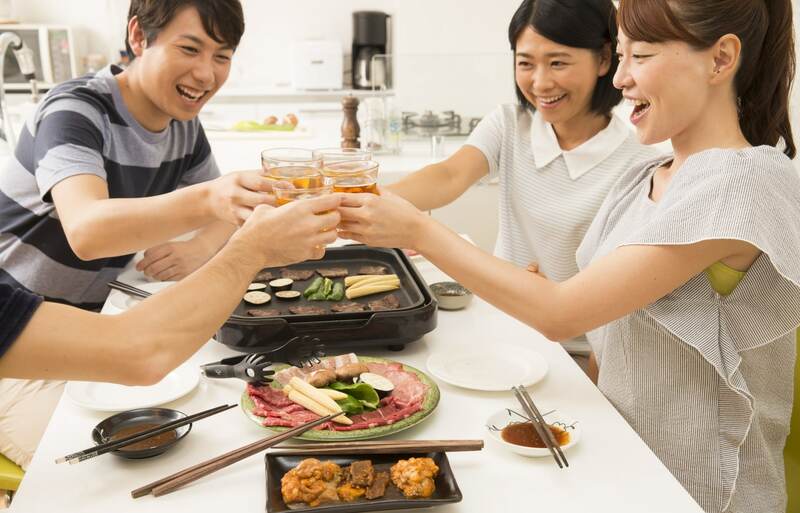 You’re supposed to be single as a prerequisite for gokon, though sometimes the kanji will be a married "neutral" party—though, as everywhere in the world, people aren't always entirely honest about their own situations. After the standard kampai (cheers), everyone offers a brief self-introduction. Then you simply talk freely, usually about topics of common knowledge. Sometimes people will initiate simple trivia or drinking-style games, but it's not a prerequisite. You’ll share contact details at the end, and if you liked someone, you’ll typically contact them the next day and pick things up from there. If people particularly enjoyed the meal, you might all head out for karaoke after, but that's about it. If you're looking for an experience that's a little more elaborate, you can look into machi-kon (街コン), where machi means "city" or "town." These may even be organized by regional committees to get people engaged in the local community. In a machi-kon, you'll typically start by choosing a drinking buddy of the same gender, and then head through various drinking and dining spots in a prescribed area. The goal in this case is to meet as many people as possible—though the sheer number of people means you probably won't remember anyone's faces. So that's it: mystery solved. Gokon are just slightly more organized versions of a night out at the pub. And if you'd like to participate in one, all you need is to make a few friends!